It’s all in the glimpses of the details! AP Images. After reading an interesting post on Melania Trump over at The Lion’s Den by the ever-observant GSL, I thought I’d highlight some of my recent favorite looks on her. I still can’t believe she is the First Lady (or that her husband is the President of the United States), but she certainly is knocking it out of the park as far as fashion is concerned. I can see how much time she has lived in Manhattan with every one of these choices—to my eye it is a very modern day Upper East Side socialite look (but with a European influence). I’m guessing she has a stylist on call and shoppers at Bergdorf’s, Michael Kors, and, apparently, Dolce & Gabbana, on speed dial. Love the Dolce & Gabbana lace skirt! 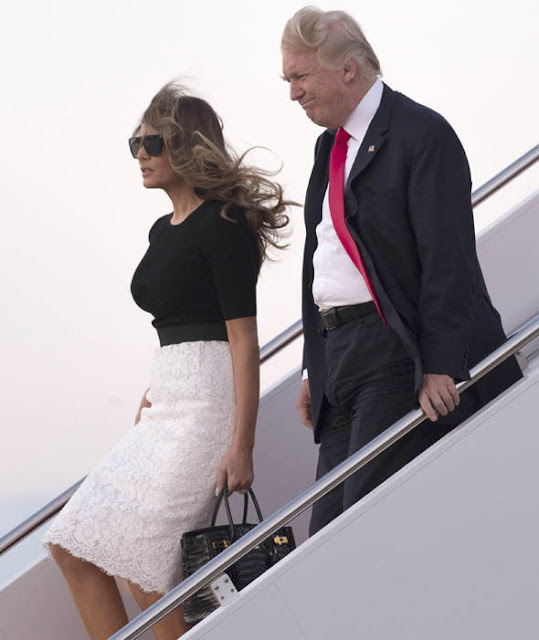 I really loved this look of a Dolce & Gabbana knit top and white lace skirt Melania wore when she stepped off from Air Force One after the G20 Summit. I may have to get my sewing machine back out to make a skirt like this myself since it retails for nearly $1,200 at Net-a-Porter. This was so great with black Manolos and a stunning Hermès Birkin! Speaking of which, I didn’t realize Melania has such a deep collection of Hermès Birkins, but I have counted four on her so far—her black croc with gold hardware, a white, a gold with white stitching, and a basic black with palladium hardware. I wouldn’t be surprised if she has a few more stashed in her closet. Let me know if you have the details on them—and please do include the size and leather and color and hardware! Love this fringed Michael Kors dress! 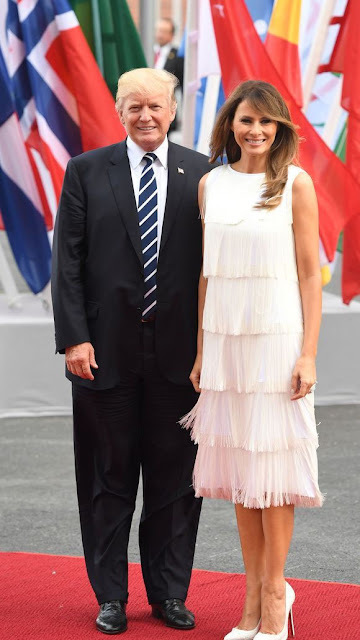 I saw over at The Purse Forum thread dedicated to Melania’s style that at least one person thought this Michael Kors fringed flapper-style dress was inappropriate for the occasion but I disagree and would counter, What should she wear? It was an evening event she was attending and it is July! I loved the way this dress moves and of course I loved how the red carpet turns the bottom half of it to pale pink as she walked. Michael Kors was far more diplomatic than Tom Ford was when asked a few months ago if he would be dressing Mrs. Trump. Kors said something non-committal and to the effect that she had been a client of his New York boutique for years. I wonder if he secretly loves it that she is wearing his clothes so often and so well. I can’t imagine it’s hurting his business. In Dolce & Gabbana in May. AP Images. 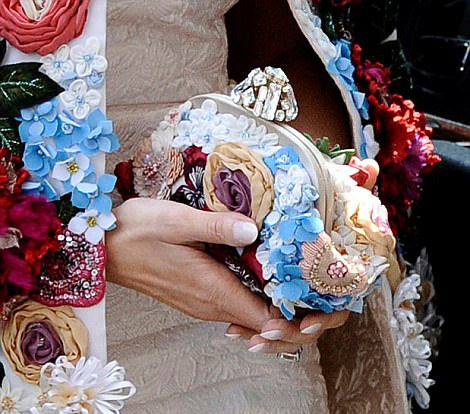 I had to laugh, in a good way, at the over-the-top Dolce & Gabbana floral coat, with ivory floral shift dress—the lining of the coat was the same fabric as the dress—with a matching floral clutch. She wore it in Sicily, where Domenico Dolce is from, and the coat sells for $51,500. She really is sticking it to the folks at Vogue with this look! The clutch matches the bag and the dress matches the coat lining! Returning to the White House in white crops, May 2017. Getty Images North America. I really liked the above white cropped pants on her, worn with a pale green cardigan and glittering rhinestone buttons, along with block-heeled shoes. This looks like a comfortable traveling outfit to me! Leaving for the Germany and Poland, July 2017. AP Images. I wasn’t sure I liked the outfit above at first but the more I see it the more it grows on me. The check-print cropped pants are by Valentino and I like that she wore them with razor-sharp suede Manolos and carried that beautiful Birkin. At a children's hospital in Paris. Wow! Reuters photo. I love the full-skirted suit with nipped in waist she wore to a visit to a children’s hospital in Paris yesterday, along with matching shoes. Hooray for midi length skirts! Of course the ensemble was by Dior. At the Bastille Day Parade, July 14, 2017. AP photo. I absolutely love this floral print dress on her with cornflower blue suede Manolos that she wore at the Bastille Day Parade. I realize there is still a lot of animosity towards Melania but since she is representing this country I have to tip my hat to her and say, Well done! Who knows, maybe she will end up being Trump’s top diplomat and secret weapon. I think some people are trying to compare her to other First Ladies, particularly Jacqueline Kennedy, but to me there is no comparison! They are different women from different eras with vastly different backgrounds. It is pointless to compare them. You can let me know what you think, if you want, but I want to remind everyone that I like you no matter who you voted for and this is not a political post! The red Dior she wore yesterday in Paris to children's hospital you highlight here was divine as was the very interesting and appropriate outfit she wore last night for dinner with The Macrons. I think Valentino would come out of retirement to do a red couture evening frock for Melania that would be so sublime Fashion's High Council would declare that Valentino-Melania Red retired from fashion and never worn again. With her coloring every color work but she still picks the very best shade then style and tailoring take it to a level we haven't seen...til now. Right now she's the best there is in high fashion and if she keeps it up will go down as the best ever. The flapper dress was just gorgeous - I love the flapper era so I am biased. Jackie was only 32 when she became first lady. Melania is a young 47. Similarities - They both married wealthy men & had access to only the best designers & they lived in & loved Manhattan. Jackie was born and raised there & moved back after JFK's assasination to raise her kids. Melania of course still lives there when she is not in Fl. or the White House. Both slim, tall, gorgeous & intelligent brunettes, who happen to be fashion icons. Love your observations! That D&G coat was perfect! I love that she wore it! D&G have been good about defending their clothes on the First Lady! I wish there was a bit more jewelry to her look! But that is just because I love it so much! Side note am glad to see the American Flag pin on the President. I think it adds a nice touch to his suits! I knew it was going to be a dangerous sign when I said - she ( melania) looks good in that ( insert outfit ) and I got chewed out on a divergent tangent. It seems anything is political. But aside from that - I think she looks fabulous. Love her outfits and that red dior is superb. 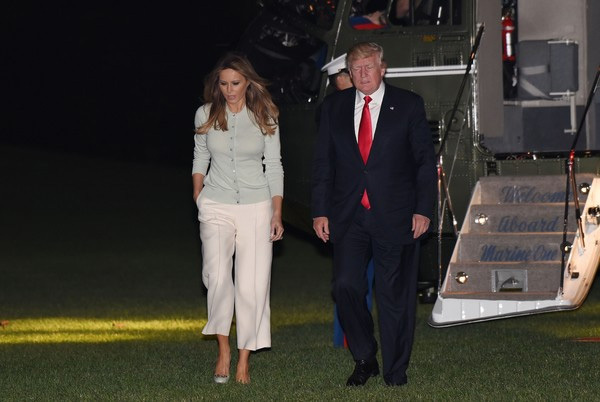 Wow, as always, Melania is stunningly attired. Can barely imagine the wardrobe expenses. Maybe some of them are regularly gifted? If I could change one thing about her appearance, it would be the long hair. At 47, imo, it's too long. The Duchess of Cambridge recently cut her very long hair at least 4 inches and it's made a huge difference in her polished style. More modern and sophisticated. Both ladies a so fun to watch! Forgot to say the red Dior dress on Melania is reminiscent of "The New Look" by Dior which took the world by storm in 1947 and angered Chanel. "The New Look" was longish, very full skirts, cinched waists & fitted jackets. The opposite of what Chanel was known for. The war was finally over, women were tired of deprivation & were ready for color, glamour & a something new. Dior brought it on & the women loved it. Hi Rosie! I agree with you on the Dior suit, so reminiscent of the New Look. I love it! I like Jackie and Melania for different reasons but I cannot bring myself to compare them. Jackie was 100% American and a New Yorker through and through, and Melania, of course, is not. I do find it so very interesting that so many people, who are protesting in the streets about immigrants' rights, reject a First Lady who is an immigrant herself. I think it says so much about the terrible state of the political landscape. I am giving her the benefit of the doubt since I do not think she wanted to be First Lady at all. That being said, at least fashion-wise she seems to be taking the job very seriously and I appreciate that!